Who Benefits from Optomap imaging? Everyone, this is safe for the whole family, even school age children. Your retinal image will be saved in your patient file so every year our doctors can see if there are any changes from your last visit. This is a great tool for patients and doctors to get ahead of any potential vision issues. What is the difference between traditional imaging and Optomap? 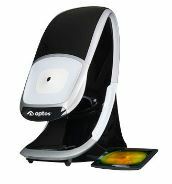 Optomap technology captures more than 80% of your retina in one panoramic image while traditional imaging typically shows 15% of your retina at a time.